The byelaws which govern public access to various UK military lands are being reviewed. UPDATE 12 August 2014: See the correspondence section below for a letter received from the MoD. “The ongoing byelaws review is looking at over 200 military sites across the UK, but each site is unique many varying significantly in size, location and purpose and there is no set of prohibitions/regulations in respect of cycling that is or will be common to all. One of the military areas that is undergoing a review of its byelaws is near Fleet, Hampshire: Minley, or as it is sometimes refered to Hawley (as there is a nearby lake with that name). Just over a year ago, a colleague from work, Tony, and I recommended that people consider a route through part of that MoD land as a more joyful alternative to cycling along car-congested and narrow A3013; see Finding a joyful, alternative route to Fleet Road. Earlier this year, the MoD held a public meeting in nearby Church Crookham to explain the effects that a greater number of troops being moved into the local area (due to returning from Germany) would have. One effect is that the MoD would be enforcing the byelaws strictly for the health and safety of soldiers and public alike. The military are allegedly telling people to cycle on the bridleway which goes along the sandy beach next to Hawley Lake, Hampshire. The MoD clarified at that public meeting that this prohibition exemption was for a paved road ie Tarmac. Thus, anything else is out of bounds for cycling, even if the route is otherwise used for driving on – such as the unpaved route suggested as an alternative to A3013 Fleet Road! Public access is permitted along all public rights of way within both training areas at all times. Thus, you can cycle along the public bridleways that go through the military area. In at least one area though, the bridleway is not well maintained but a nearby footpath has been upgraded with packed gravel. The military are allegedly telling anyone who is cycling on that improved footpath that they must use the bridleway instead, even though it is poorly maintained and goes across a sandy beach by the lake! The military, as land owner, can decide whether to sue people for damages if they cycle or ride a horse on the footpath contrary to their byelaws (it is a civil tort not a criminal matter*). It appears, though, that the military may be targeting people cycling but not riding a horse. Aside: last year the Scottish government ran a safety campaign with the slogan ‘See Cyclists – Think Horse‘. Attempts to contact the Officer Commanding the Hawley MoD site regarding the situation around cycling have so far not been successful. Watch this space…for cycling. Cyclists have no right to cycle on footpaths away from the road but only commit an offence where local by-laws or traffic regulation orders create such an offence. Cyclists can ride on bridleways, but not on countryside footpaths. To do so is a civil tort, ie not a criminal matter, the landowner has to sue the transgressor for damages (of which there’s likely to be none). 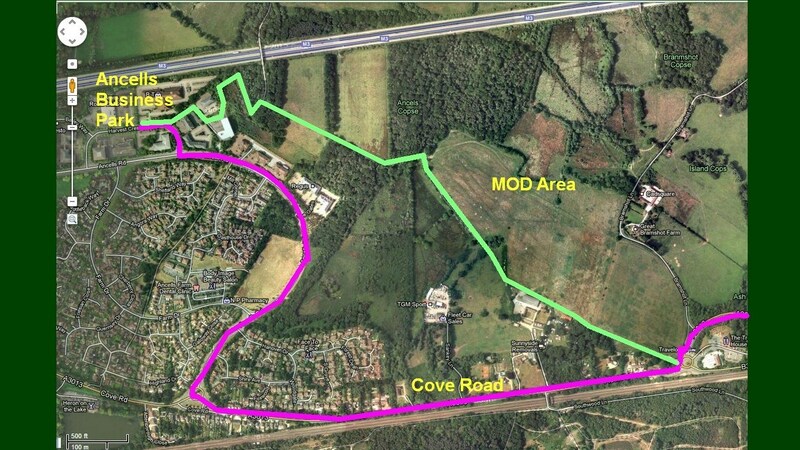 12 August 2014: Email received from MoD – note that their statement about Cove Road refers to a safer alternative route that I proposed last year…see the article “Finding a joyful, alternative route to Fleet Road“. I have been asked to respond to your questions regarding the situation as regards cycling on the Aldershot and District Military Lands, and specifically the training areas at Hawley and Minley. The Byelaws are being enforced for cyclists, as well as pedestrians and horse riders but as Im sure you are aware all are entitled to use bridleways. As you correctly state, as the Byelaws currently stand, cyclists are prohibited other than on bridleways from all parts of the training area. The exception is a road made up for general vehicle use, for which the legal interpretation is a road constructed for use by members of the public as well as the military such as the Bourley Road. As regards to your specific proposal concerning the Cove Rd, whilst I have sympathy for your concern I would have to point out that the route you propose is over, not alongside, MOD land and is our main access track to that part of the area. It is not a ‘made up road’ but is of rough gravel construct, and furthermore has several blind bends. If a member of the public were to be injured in any way and we had sanctioned its use then we could be held liable as it is not a public right of way, and as such transit by cyclists is specifically prohibited by the Aldershot and District Military Lands Byelaws which govern its use. 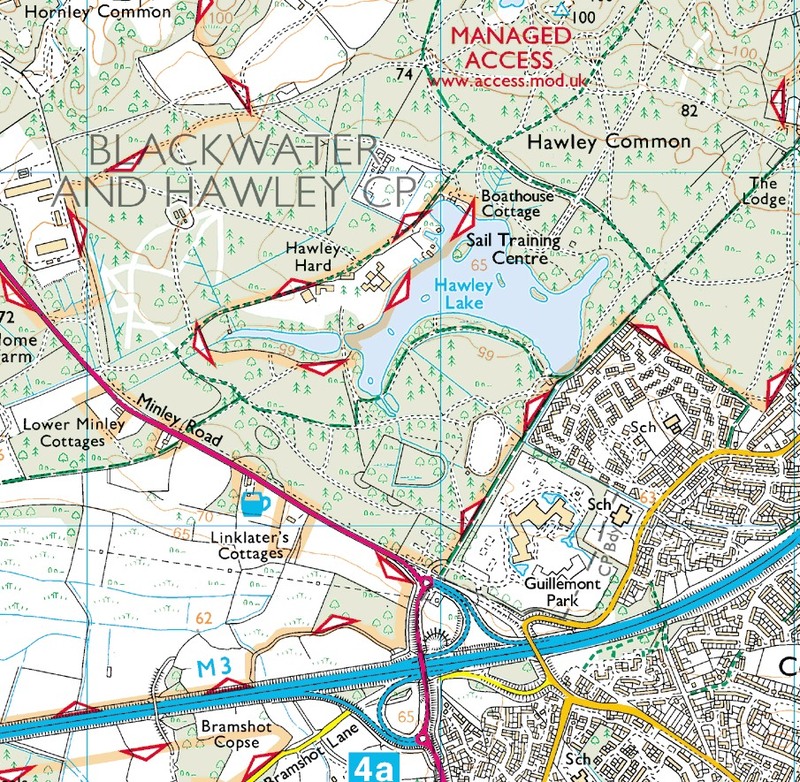 You point out that the public footpath at Hawley Lake is well maintained, but that the bridleway is not, and before responding to your email I took the opportunity to walk/drive both of these tracks with the senior Training Safety Marshall who has responsibility for that area. We also drove your proposed Cove Rd bi-pass route discussed above. I would have to say that whilst I agree with you that the bridleway is not that well suited for all types of bike, especially in winter, its sandy surface is favoured by equestrians as well as by the mountain bike fraternity, who enjoy the challenge it presents. I am sure you are aware however that as a bridleway its upkeep and maintenance is the responsibility of the Highways Authority, so I would suggest your question best directed at them. As regards the wider issue of cycling on the Military Lands you are aware that the Byelaws are currently under review and that the Byelaws team are working this through, so I would not wish to pre-empt their findings in any way. What I would say however is that with the return of forces from Germany, as well as with the introduction of our new wheeled armoured fleets, the pressure on the training estate in the UK is likely to be more rather than less, and that there are likely to remain considerable challenges in achieving a balance between the wishes and desires of the cycling community and the purpose of defence. Please see the correspondence from the MoD regarding the poorly maintained bridleways across their lands, especially around Hawley Lake, Fleet. Will Hampshire County Council as highways authority inspect and take out whatever repairs and upgrades are needed? Will Hampshire County Council immediately reduce the road danger of Cove Road for people that choose to cycle or walk along it, especially in light of the letter from the MoD? Thank you for that detailed reply as well as taking the time to investigate personally the noted areas. I am very surprised – and find ironic – that the MoD will not support the proposed safer cycling route on health & safety grounds! I have forwarded your message to the Highways Authority (Hampshire County Council) to bring to their attention the bridleways and Cove Road issues given your statements. I very much hope that a solution can be found by the MoD in the short-term to permit people to use the safer route instead of Cove Road whilst Hampshire County Council look to reduce the road danger there. I’m afraid this is unrelated to your cause (which I support, by the way), but I am trying to get in touch With Mark Ludlow, with whom I served in Bosnia about a million years ago. My Name is Max Atherton, and I can be reached at maxgorki@gmail.com. If you can help, thank you. If not, I suggest you bring your bikes to Colorado. We have some pretty good cycling here.